Zagara is a demolitionist class hero in Heroes of the Storm taken from the Starcraft universe. She excels at destroying structures and is a beast in 1v1 situations with astonishing damage output. Zagara has plenty of excellent talents which help her overcome her downsides, and make her even more powerful in other areas. What Zagara lacks in defense and mobility, the makes up for in damage output. For demolishing structures she has quite a lot of tools at her disposal, from long-range damage spells to summonable voidlings that help quickly expend turret ammo. Zagara’s playstyle is a bit similar to Nazeebo’s, but I definitely consider Zagara a more potent and versatile specialist. For a full HotS Zagara hero guide including spells, talents, heroic abilities and various tips and tricks keep reading our guide! Disclaimer: the recommended talents are based on my personal preferences and play style, and are by no means the only way to play Zagara. 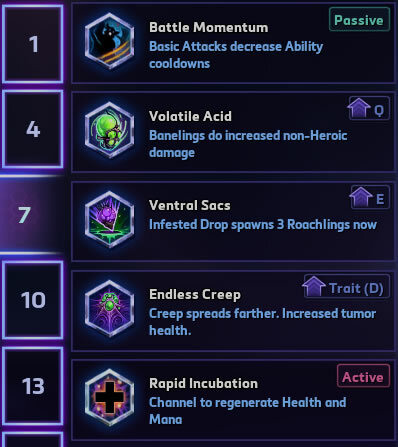 It’s intended for newer players looking for a quick guide, and once you start grasping Zagara’s basics you should experiment and see what works for you! Choice of talents may also depend on map or team composition. Trait: Creep Tumor – Lays a creep tumor at a target location giving you and your minions increased movement speed and health regeneration while standing on it. Q: Baneling Barrage – Launch 4 Banelings in a straight line dealing splash damage near the first target hit. W: Hunter Killer – Summons a Hydralisk on your enemy, following them and dealing damage. E: Infested Drop – Targets a small area dealing damage and summoning Roachlings which attack your enemies. R: Devouring Maw – Disables all enemies within a targeted area dealing damage. 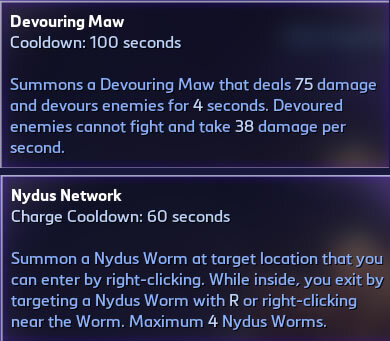 R: Nydus Network – Summons a Nydus Worm at a target location, allowing you to enter them by right-clicking on one. You can exit on any Nydus Worm anywhere, and you can summon up to 4 of them at the same time. 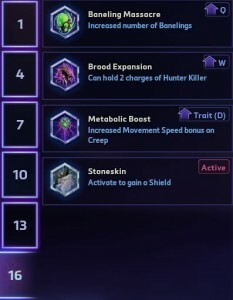 Below we’ll take a closer look at talent choices at levels 1, 4, 7, 13, 16, and 20. 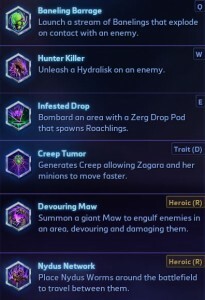 You can also refer to it if you want to find out which talents are usually best on Zagara and which ones to pick and avoid. Centrifugal Hooks – Banelings (Q) can travel twice as far. Corpse Feeders – Roachlings take less damage from non-hero sources. Reconstitution – Increased health regen while standing on Creep (trait). Demolotionist – Basic attack against Structures destroys 1 ammo and deal extra damage. 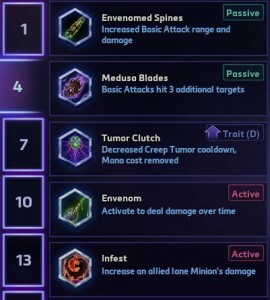 In almost all cases I pick Demolitionist — Zagara is very good at sieging and pushing turrets, and dealing more basic attack damage and spending turret’s ammo is very helpful. Corpse Feeders and Centrifugal Hooks can be rather helpful as well though: Feeders can tank structures a bit longer allowing you to get a few more hits in, and Centrifugal Hooks gives you an absurd range on Banelings allowing you to deal continuous siege damage from a screen away. Envenomed Spines – Increases Zagara’s basic attack range and gives them a slight DoT effect. Medusa Blades – Basic attacks hit 3 additional targets. Tumor Clutch – Decreased cooldown on Creep Tumor (trait), and casting it no longer costs mana. Envenom – Active ability dealing DoT damage to an enemy hero. Infest – Increases the damage of an allied lane minion for 30 seconds by 400%. 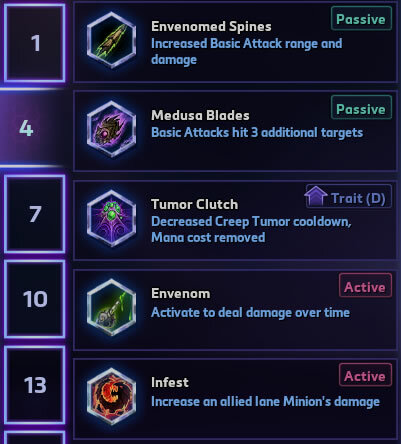 Plenty of viable choices with level 4 talents, but I almost always prefer taking Envenomed Spines. 20% increased basic attack range gives you plenty of breathing room and ensures you can stay relatively safe when constantly pushing down towers, keeps, and forts. Medusa Blades gives you additional quick wave clear, though with so much AoE abilities Zagara doesn’t really need help with that. In the same way Envenom can be good, but Zagara is a wonderful duelist and typically doesn’t need extra damage. Though Infest does hold two charges and helps you also keep your minions on the enemy side of the map, it’s too situational to be taken in most cases. Battle Momentum – Each basic attack decreases ability cooldowns by 0.5 seconds. 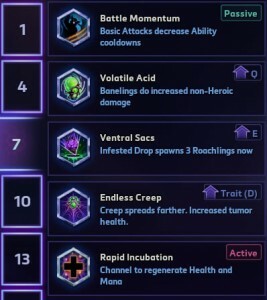 Volatile Acid – Banelings (Q) do increased non-Hero damage. Ventral Sacs – Infested Drop (E) spawns 3 Roachlings. Endless Creep – Creep (trait) spreads 50% further and has increased health. Rapid Incubation – 45-second cooldown active spell restoring up to 25% of your health and mana (3 second channel time). All five of these talents have their uses and usefulness, but Rapid Incubation is hands down the best one. Channeling for 3 seconds is rarely a problem, and the extra health and mana you get can save you many trips to the healing fountains. Rapid Incubation is a wonderful talent with only a 45-second cooldown and my top recommendation for majority of games. Devouring Maw – Completely disables all enemies within a targeted area for 4 seconds, and deals damage for the duration. 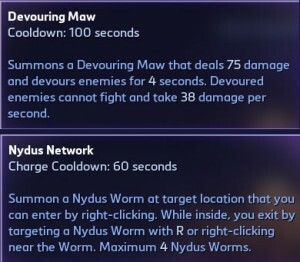 Nydus Network – Summons a Nydus Worm at a target location, allowing you to enter them by right-clicking on one. You can exit on any Nydus Worm anywhere, and you can summon up to 4 of them at the same time. Nydus Network is an interesting choice but more suited for players who are better skilled in HotS than I am. It can give you plenty of mobility and help with ganks or taking global map objectives quickly, but I always found it difficult to take proper advantage of it. Devouring Maw however is much easier to use, and extremely useful. It’s an Area-of-Effect spell which completely disables all enemy actions, and it can wreck entire teams in teamfights. Not only is it one of the scariest AoE disables, but it also deals a decent amount of damage. This ultimate can is also a great escape tool since everyone will try to avoid getting caught by it, but it’s best used to set up other abilities and wreck teams with AoE combos. 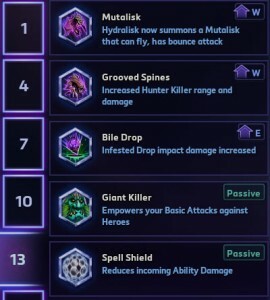 Mutalisk – Hydralisk (W) now summons a Mutalisk with increased duration and splash damage. Grooved Spines – Hunter Killer (W) now has 35% extra range and 20% extra damage. Bile Drop – Infested Drop (E) has increased damage. Giant Killer – Increases your basic attack damage against enemy Heroes. Spell Shield – Reduces subsequent incoming ability damage once every 30 seconds. I prefer upgrading my Hunter Killer’s range and damage with Grooved Spines. This little beastie is very good at chasing enemies, and this talent allows him to be even more annoying and attack enemy champions from further away. Mutalisk can also be a good choice for some additional wave clear, and it lasts considerably longer. 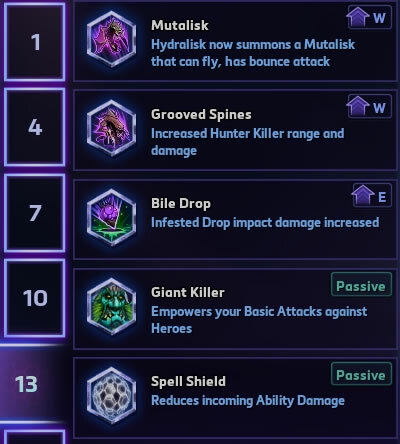 I typicaly avoid taking Giant Killer and Spell Shield on Zagara as they are both sub-par damage/defensive talents. Baneling Massacre – Increases number of Banelings (Q) summoned from 4 to 8. Brood Expansion – You can hold 2 charges of Hunter Killer (W). Metabolic Boost – Increases your movement speed bonus on Creep (trait). Stoneskin – Active ability giving you a 5-second shield equaling 30% of your max health once a minute. If you’re feeling particularly squishy and can’t help but get caught by assassins, Stoneskin can be a very helpful talent. Metabolic Boost also gives you quite a lot of increased mobility while standing on Creep. However, both talents fall short for me compared to Baneling Massacre and Brood Expansion. I typically go for the former: Baneling Massacre really is true to its name, and spitting out 8 Banelings can deal significant Hero damage in teamfights or even 1v1 skirmishes, or alternatively help you take down structures even quicker. Tyrant Maw – Devouring Maw (R) deals 50% more damage, and it’s cooldown is reduced by 25 seconds for each Hero killed by it. Broodling Nest – Spawn Broodlings when exiting a Nydus Worm (R). Fury of the Storm – Basic attacks will occasionally chain to enemy Minions and Mercenaries. Bolt of the Storm – Active ability allowing you to instantly teleport a short distance. Definitely Bolt of the Storm. It’s one of the best — and perhaps THE best escape ability in the game, and since you have very limited defensive tools on Zagara I would certainly recommend taking it in nearly all situations. This is the build I go for in most games, and whenever I’m in doubt I just go for what I know works well for me. 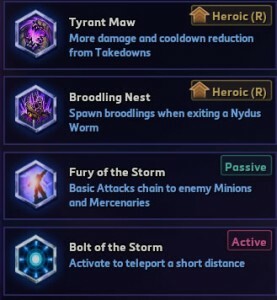 There are of course other options and it often depends on team composition and who you play against, but this Zagara build works well and it a good starting point for anyone looking for a quick guide. Use your Hunter Killer (W) and Infested Drop (E) while pushing towers for extra damage and to quickly expend ammo. Keep Creep (passive trait) always on your retreat path. In case you have to escape to the safety of your structures having extra movement speed can be immensely helpful. If possible, hide Creep in brushes. Heroes will usually need to enter the bush to destroy it, which can perhaps put them in a more exposed position where you can hit them with your Baneling Barrage (Q). If you have nothing else to do, use Baneling Barrage (Q) on enemy structures. Want more Zagara talent builds, and secret strategies to dominate your enemies every game? Click here. 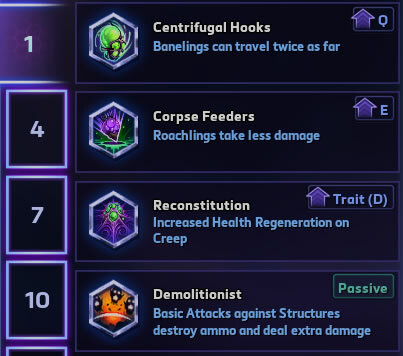 Zagara is a true specialist champion: very much capable of destroying structures from afar and quickly, this Zerg can stay fairly safe when doing it. Her defensive capabilities are very limited, but both single-target and AoE damage is comparable to most characters in Heroes of the Storm. 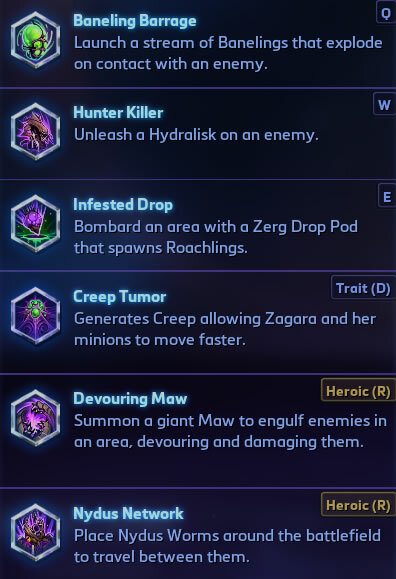 With summoned zerglings and Creep you can frequently poke enemy heroes from range and stay fairly safe while doing it, so make sure to play to Zagara’s strengths and don’t go face first into fights. She can get blown up very quickly if caught overextended in lane (or anywhere else), so always be cautious and patient. 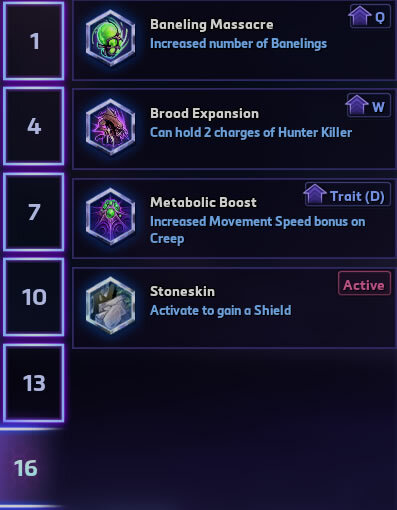 Do you have your own way of playing Zagara? Let everyone know how to make the most out of this hero in the comments below.